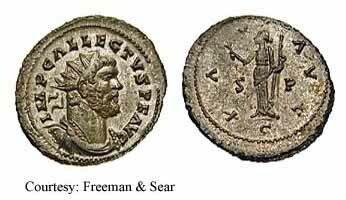 293 - 296 Allectus was the second and last of the Roman British secessionist emperors succeeding Carausius whom he murdered. 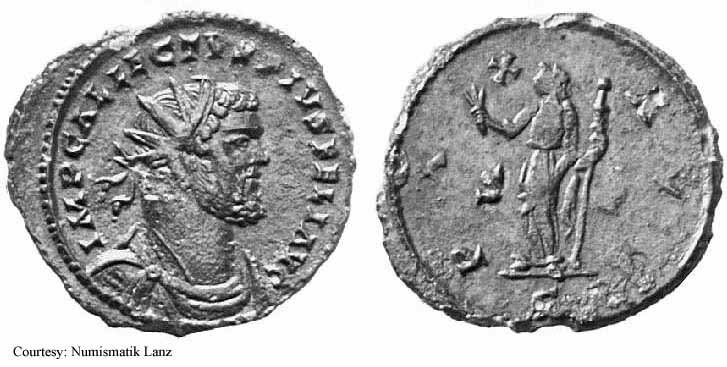 Being under the gun as was Carausius his solo career came to an end when Constantius Chlorus mounted a well-planned invasion of Britain and was subsequently killed in battle by one of Chlorus's detachments. RIC 1, Burnett 4, Depeyrot 4/1 Aureus Obv: IMPCALLECTVSPFAVG - Laureate head right. 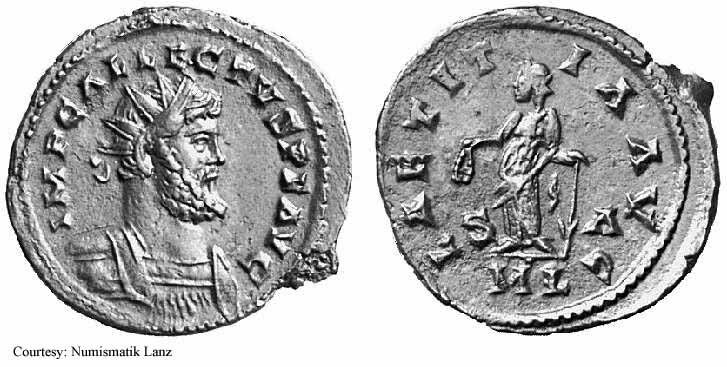 Rev: ADVENTVSAVG - Allectus riding horse left, raising hand; seated captive o left. 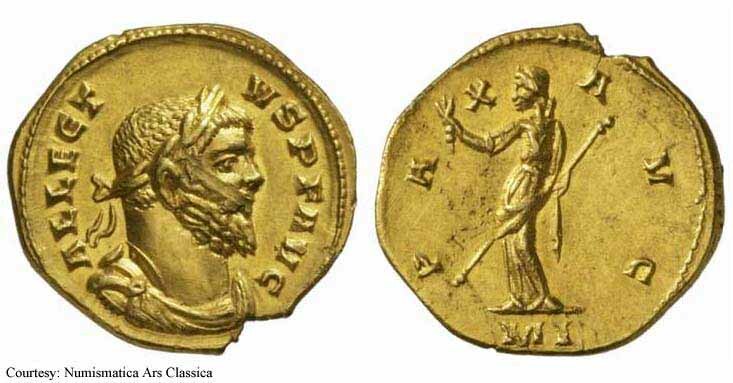 c.293 (Londinium). $16,295 12/5/02. RIC 7, Burnett 2, Depeyrot 4/12 Aureus Obv: ALLECTVSPFAVG - Laureate, draped and cuirassed bust right. Rev: PAXAVG - Pax standing left, holding branch and scepter. 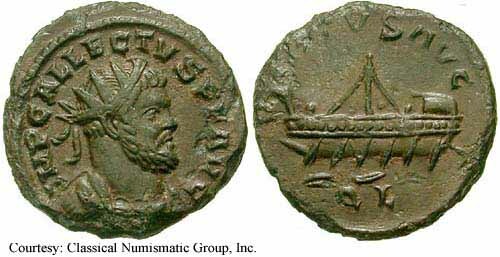 c.295 (Londinium). $28,517 12/5/02. RIC 22, Burnett 36 Antoninianus Obv: IMPCALLECTVSPFAVG - Radiate, cuirassed bust right. Rev: LAETITAAVG Exe: S/A/ML - Laetitia standing left, holding wreath and anchor. 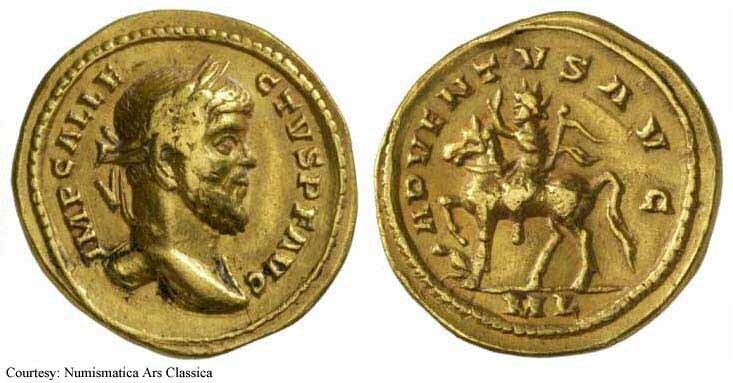 293-295 (Londinium). 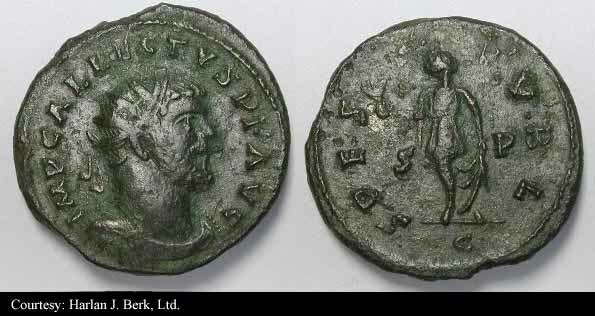 RIC 28c Antoninianus Obv: IMPCALLECTVSPFAVG - Radiate, draped and cuirassed bust right. Rev: PAXAVG Exe: S/P/ML - Pax standing left, holding palm and scepter. RIC 28f Antoninianus Obv: IMPCALLECTVSPFAVG - Radiate, cuirassed bust right. RIC 33f Antoninianus Obv: IMPCALLECTVSPFAVG - Radiate, cuirassed bust right. Rev: PAXAVG Exe: S/A/ML - Pax standing left, holding branch and scepter. 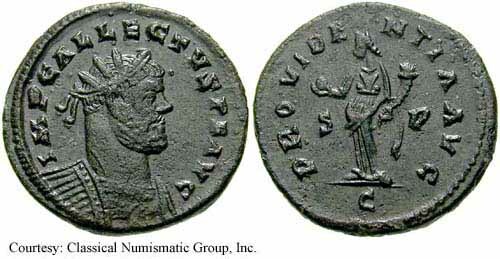 RIC 33h Antoninianus Obv: IMPCALLECTVSPFAVG - Radiate bust left, wearing imperial mantle and holding scepter with eagle atop. 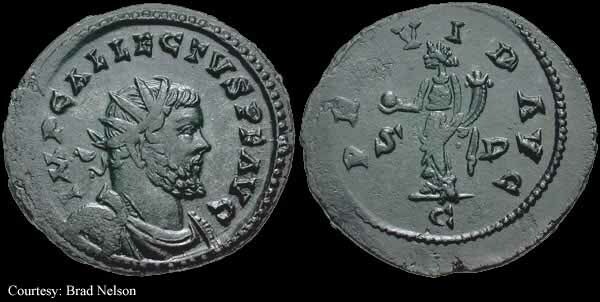 RIC 69 Antoninianus Obv: IMPCALLECTVSPFAVG - Radiate, cuirassed bust right. Rev: FIDESMILITVM Exe: S/P/C - Fides standing left, holding standard in each hand. 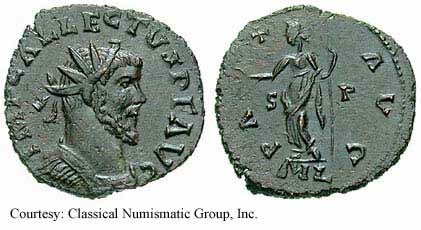 RIC 76 Antoninianus Obv: IMPCALLECTVSPFAVG - Radiate, draped and cuirassed bust right. Rev: LAETITIAAVG Exe: S/P/C - Laetitia standing left, holding wreath and anchor. 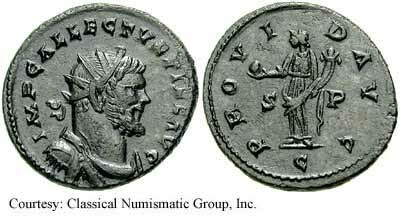 RIC 86 Antoninianus Obv: IMPCALLECTVSPFAVG - Radiate, draped and cuirassed bust right. Rev: PAXAVG Exe: S/P/C - Pax standing left, holding branch and scepter. (Camulodunum). 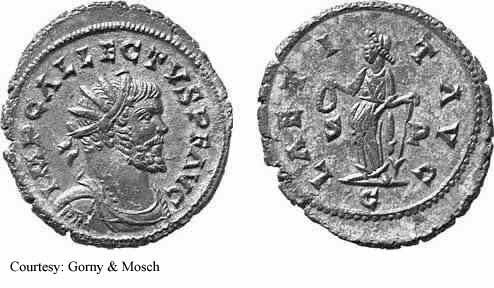 RIC 91, Burnett 147 Antoninianus Obv: IMPCALLECTVSPFAVG - Radiate, draped and cuirassed bust right. Rev: PAXAVG Exe: S/P/C - Pax standing left, holding branch and scepter. 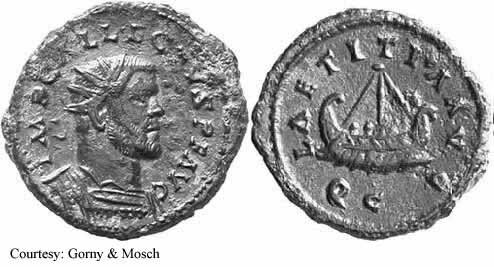 293-295 (Camulodunum). 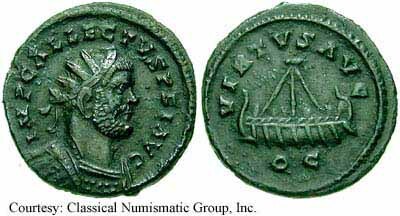 RIC 94 Antoninianus Obv: IMPCALLECTVSPFAVG - Radiate, draped and cuirassed bust right. Rev: PROVIDAVG Exe: S/P/C - Providentia standing left, holding globe and cornucopia. 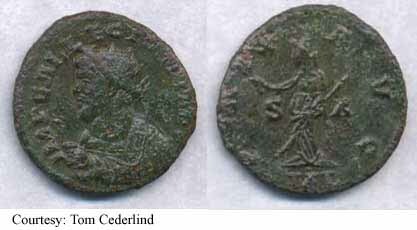 293-295 (Camulodunum). $280 8/18/02. RIC 100 Antoninianus Obv: IMPCALLECTVSPIFEAVG - Radiate, cuirassed bust right. Rev: PROVIDAVG Exe: C - Providentia standing left, holding globe and cornucopia. RIC 108 Antoninianus Obv: IMPCALLECTVSPFAVG - Radiate, cuirassed bust right. Rev: PROVIDENTIAAVG Exe: S/P/C - Providentia standing left, holding globe and cornucopia. 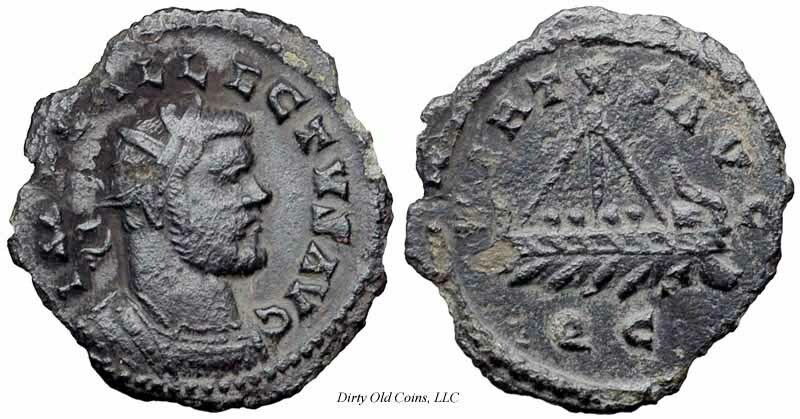 RIC 115, C 69 Antoninianus Obv: IMPCALLECTVSPFAVG - Radiate, draped and cuirassed bust right. Rev: SPESPVBL Exe: S/P/C - Spes advancing left, holding flower and raising skirt. 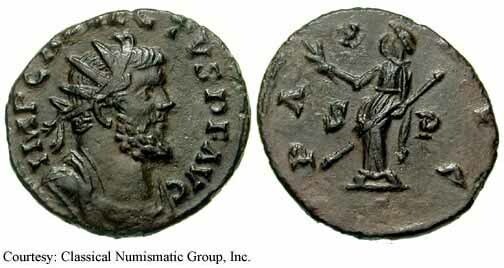 Unlisted Antoninianus Obv: IMPCALLECTVSPIVSFELIAVG - Radiate, draped and cuirassed bust right. 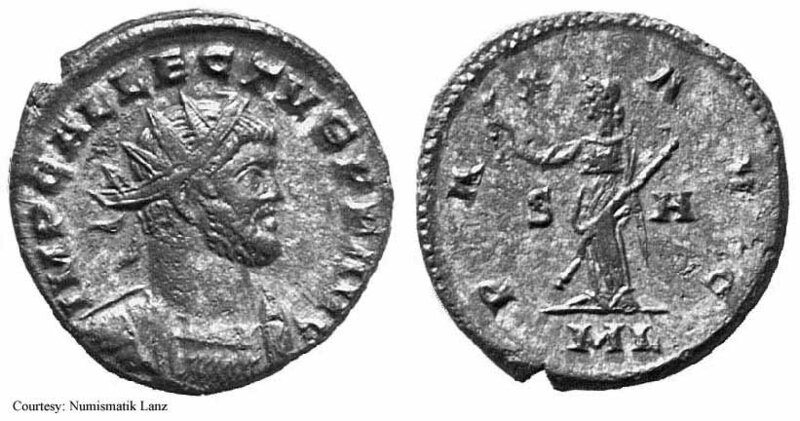 RIC 55, Burnett 111 Antoninianus Obv: IMPCALLECTVSPFAVG - Radiate, draped and cuirassed bust right. Rev: VIRTVSAVG Exe: QL - Galley sailing right. (Londinium). RIC 124f Antoninianus Obv: IMPCALLECTVSPFAVG - Radiate, cuirassed bust right. Rev: LAETITIAAVG Exe: QC - Galley sailing right. RIC 128f Antoninianus Obv: IMPCALLECTVSPFAVG - Radiate, cuirassed bust right. Rev: VIRTVSAVG Exe: QC - Galley sailing left. $335 9/19/01. 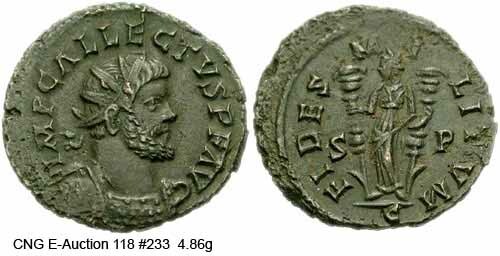 Unlisted Antoninianus Obv: IMPCALLECTVSPFIAVG - Radiate, cuirassed bust right. Rev: VIRTVSAVG Exe: QC - Galley sailing left. $200 9/19/01.